Kids and adults alike will love the party atmosphere of Blue Man Group, playing on the world-famous Las Vegas Strip! Combining music, comedy and multimedia theatrics, the Blue Man Group is a totally unique form of family-friendly entertainment. 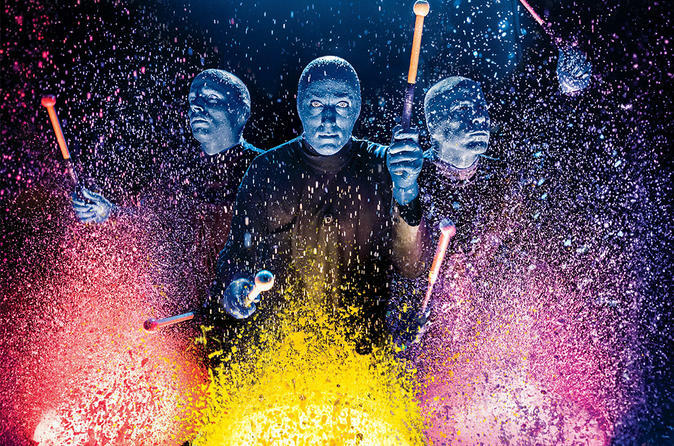 The creative collective at Blue Man Group celebrates the latest evolution of their live show that bursts with fresh color and vibrant sound. The updated show combines new instruments, music, video and lighting with the group's iconic vignettes, all designed to create an unforgettable euphoric experience. The result is inventive, thought-provoking, hilarious and 100% Blue Man Group. Each night the Blue Men deliver an extraordinary spectacle as well as a soulful and primal kind of euphoric experience that makes you feel vibrantly alive and more closely connected with the people around you. To view a seating chart please click on 'View Additional Info' below. Special Offer - Book and save between 30% and 40% compared to the local operator's price for Category A and C Seating! - Book Now!